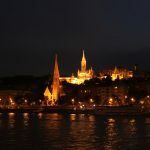 Enjoy a scenic Danube river cruise in the city of Budapest, taking in the dozens of beautiful sights along the riverfront, while sipping away 2 free drinks, or enjoying our lovely and rich buffet style lunch on the cruise ship. For a more traditional sightseeing boat experience on the Danube, please read on. The all inclusive Lunch & Cruise boat tour includes 2 free drinks by default, and you can also choose to have the optional Buffet Lunch. Note: The 2pm boat cruise can be booked with lunch, or without lunch, with adult, and with children / student prices. Children under 6 years old are free to cruise. Please take a look at our city cruise options. 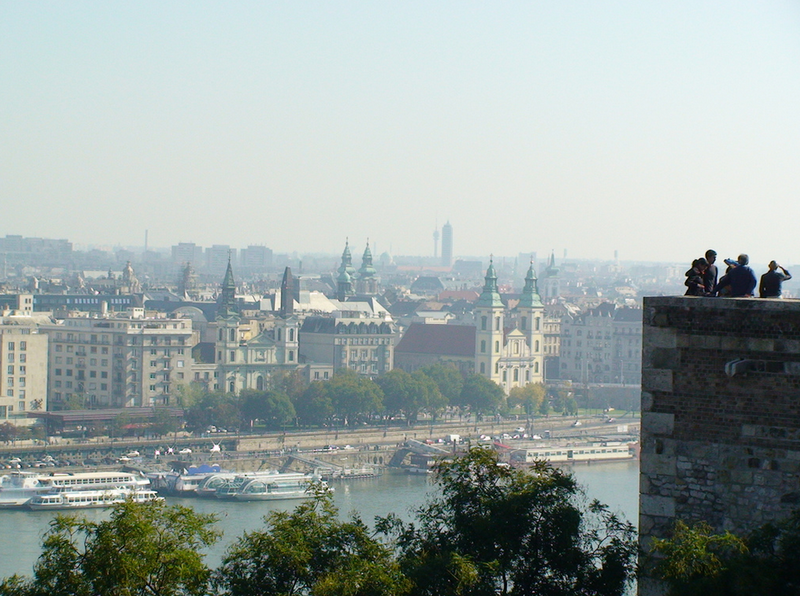 Danube river cruise prices start from approx. Euro 10 for the budget tourists up to Euro 75 for VIP cruises. 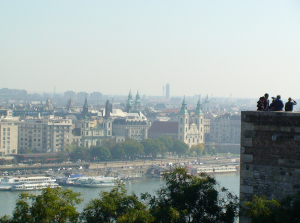 Learn more about the Budapest river cruises or place your booking now. 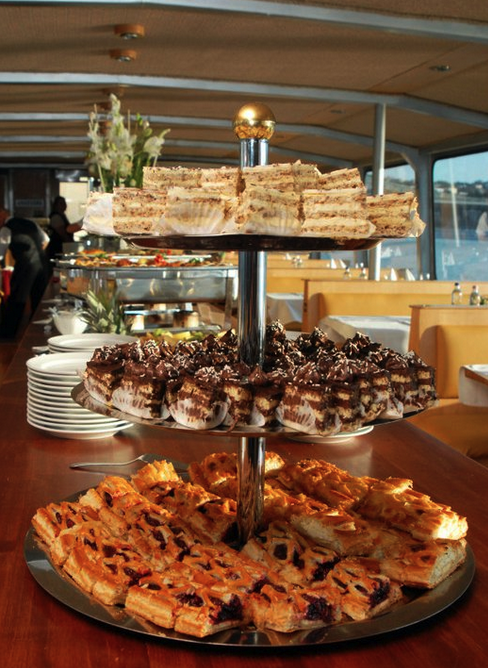 Each afternoon, the Budapest Lunch river cruise runs from 2pm to 3.30pm. 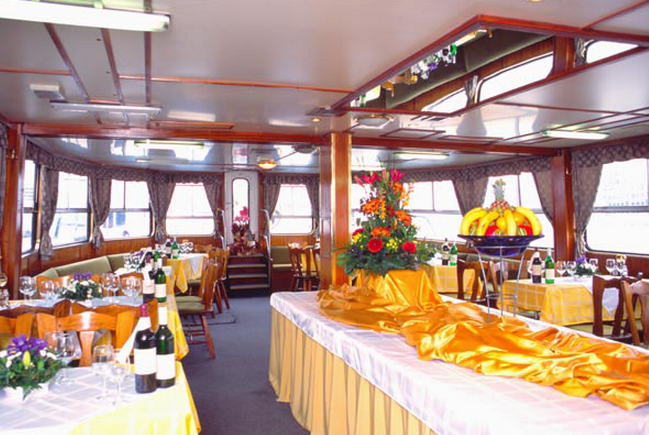 The boats are air conditioned in the summer, and heated in winter, so the river cruises are on all year round. Please note that the lunch cruises on Friday, Saturday and Sunday are very popular, and very often get fully booked days before the cruise date. We kindly advise you to book your day cruise in advance if you wish to include the boat ride in your Budapest visit. Cruise Price with Lunch: 40 Euro (discount price with lunch for Students: 36 Euro). Cruise Price with Drinks only: 18.5 Euro (discount price with drinks only for Students: 17.5 Euro). 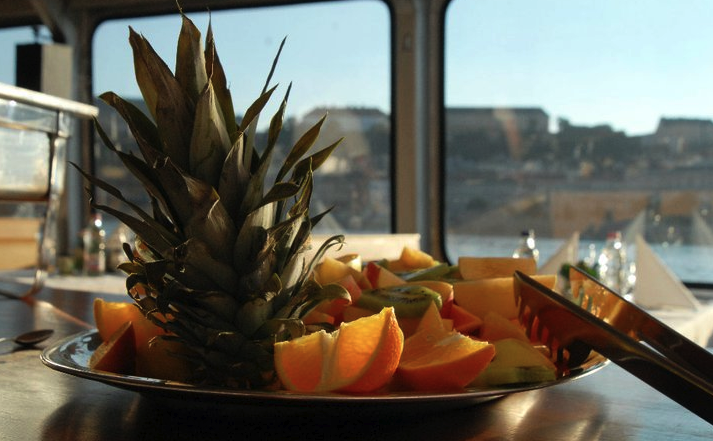 Cruise Price with 7 Tier Wine Tasting: 33 Euro (discount price with 7 Wines for Students: 31 Euro). Cruise Price with 2 Cocktails: 26 Euro (discount price with 2 Cocktails for Students: 24 Euro). Cruise Price with 5 Craft Beers: 29 Euro (discount price with 5 Craft Beers for Students: 27.5 Euro). Secure your seat on the river cruise now. 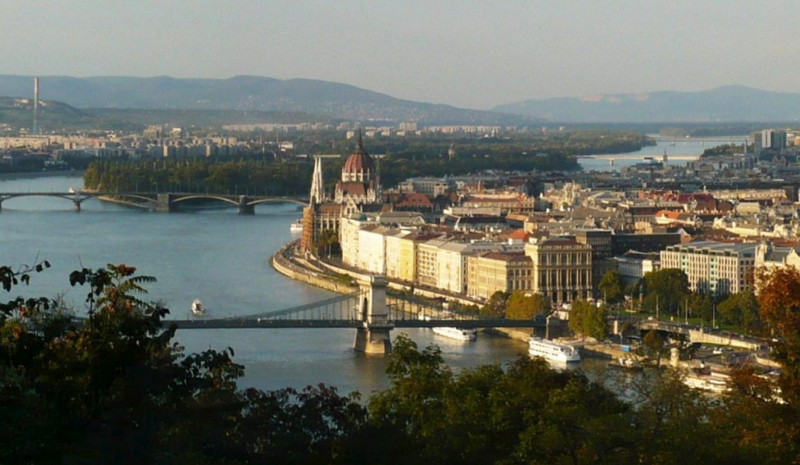 In high season (May, June, July, August, September, October), our afternoon Budapest day river cruises get easily full. You can book your day cruise in advance in our online booking form: Booking Budapest Day Cruises (also on the left side of this page). 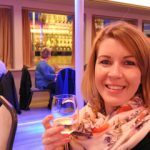 How can I buy tickets for the day trip on the Budapest Boat Tour? * on the former day river cruises, guests had the pleasure to eat the meals made by the former chef, Klöter Gregor-Grex, Gault Millau rated chef. 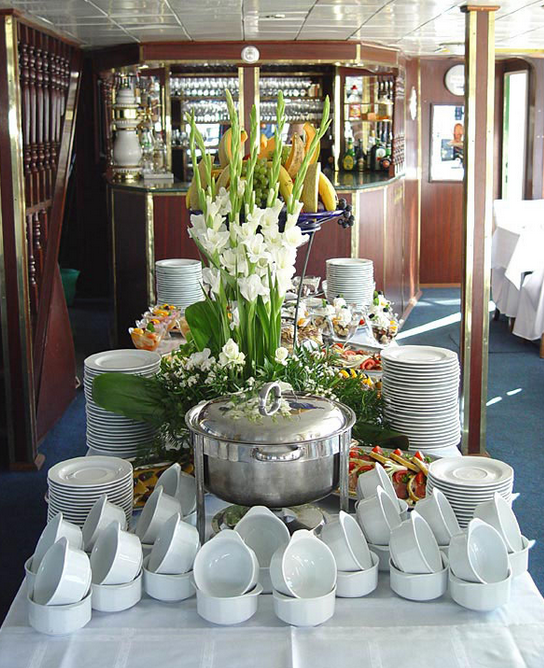 There is great emphasis on the quality of the meals (lunch and dinner cruises) to make boat tours unforgettable. Gault Millau is one of the most influential French restaurant guides founded by two restaurant critics, Henri Gault and Christian Millau in 1965. Gault Millau restaurant guide is as well known and respected in Europe as Zagat is in the US, Harden’s in the UK or the Michelin Guide all over Europe (though each have their own rating system and distinctive style). Since September 2012, the lunches and dinners feature more traditional Hungarian foods as well as a wide range of options of healthy and popular meals of the international meals. The dishes are made by Attila Tanacs, local star chef. In the 90 minute Lunch & Cruise river cruises, you can see many of the top Budapest attractions like the majestic Hungarian Parliament building, the fairy tale Fisherman’s Bastion, the historical Buda Castle, the impressive Great Market Hall, the popular indoor Budapest market hall of the inner city, and many more less known gems, like the University of Economics, the Vigado Concert Hall, the Technical University, etc. Please can you tell me where the boarding point is for the river lunch cruise? hi, are you able to please provide a phone number that I can call to ask a few details about the christmas day lunch cruise. should you have any questions or inquiries, please do not hesitate to contact us by email at info [at] budapestrivercruise.com. Thank you. Hello, Do you have an office location to come book tickets and ask a few questions? Hello Sunny, the various programs have different offices at the docks depending on which cruise you are interested in. You may contact us via email for the fastest / most up to date and comprehensive reply on Budapest river cruises on the Danube (regardless of which cruise program you wish to take), including prices, frequency, discounts, ships, lengths, guides, accessibility, surprises and gift vouchers, etc. 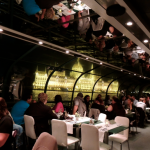 Please contact [info] at [budapestrivercruise] dot [com]. Is there any boat cruises today for a group of 10, some of us are students, would you be able to tell me the cheapest option? the cheapest daytime sightseeing cruise is the 2 pm cruise & guide. The price is €13 per person for adults and €11.7 per person for students. It includes 70 min cruise with guide (earphones, 30 languages), 1 free drink (options: wines, beers, sparkling wines, soft drinks) and 1 lemonade, free wifi. We are a group of 14 from Finland. We could possibly come to day cruise which leaves at 2 pm 22nd march. We are a group of people where there are three birthday people. Is there a possibility organise gluteinfree Food for two people or do you have it already in your menu. For the birthday there could be sparkling wine served too. The prices includes 1 welcome drink (sparkling wine), 1 free drink (wine, beer or soft drink) and 1 bottle of water. I wanted to ask, how do you book the “Almost open bar” lunch cruise? Does that also include the 2 free drinks as the normal lunch cruise? We have contacted you via email regarding your booking. Im trying to book a lunch cruise but I dont see an option to buy kids tickets. Which option do I choose? The 2 pm Lunch Cruise is free for Children under the age of 6 (that is you do not need to buy tickets for them), while students can buy student tickets for a reduced price. First, choose the preferred date of your cruise then you will be able to choose between Adult, Student or Adults and Students tickets. 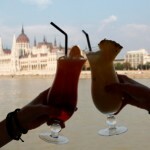 Have a brilliant time on the 2 pm Lunch Cruise in Budapest! Please could you provide a quote for private boat trip including buffet lunch and drinks. We will send you an email from soon. Hi, I cant deside between lunch cruise or coctail cruise. Is there a possibility to buy cocktails on the lunch cruise? Yes, of course, drinks and cocktails can be bought at the bar on board during the lunch cruise. Hi, are 1 year olds allowed on the cruises at all? And if so, are they allowed on both day and evening cruises? My family is coming over Christmas and we are trying to plan some Christmas activities! yes, children are allowed on the Christmas Buffet Cruises (at 2pm, 6pm and 9pm). 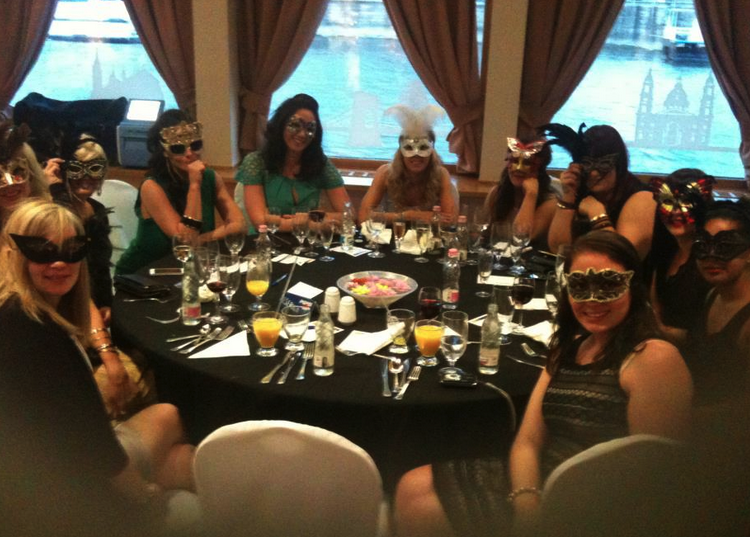 Please kindly note though that on the Christmas Eve Cruise with 4-course Dinner has an age limit of 6 years. Thank you for your understanding. Please could you provide some information on the drinks and lunch packages you offer? if you purchase a ticket with buffet lunch, there will be 3 drinks included (1 welcome drink of soft drink or sparkling wine), 1 free drink of your choice (beer, wine or soft drinks) and 1 bottle of water. If you purchase the ticket with 2 drinks, you will receive 1 welcome drink and 1 free drink of your choice.